The DSA leadership is exuberant about the results of the November, 2017 elections, as is the Democratic Party in general. DSA is boasting about the successful election campaigns of fifteen DSA members. These results should be taken in the context of the general situation in the United States, starting with the fact that politics is first and foremost a matter of class struggle. In the industrial arena, no socialist would consider it acceptable that the entire union movement was dominated by the employers, that the employers (that is, the capitalist class) was thoroughly integrated into the unions. They would denounce this as company unionism! But yet so many see this as perfectly acceptable in the political arena, through the Democratic Party. Contrary to what they think, it is exactly the absence of the working class as an independent force that explains the political situation in the US today. Such independence can only be expressed in an organized way, which means through a political party – a working class political party, which the Democratic Party is not and never can become. This absence is integral to the low level of class consciousness in the US working class, and it is this low level which explains why it is estimated that some 30% of union members voted for Trump. She may be a DSA member, but in no way do her politics even remotely reflect socialist – even social democratic – policies. 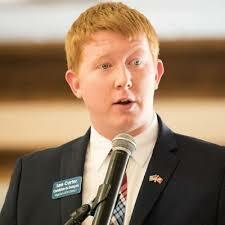 Probably the most prominent DSA candidate who won is Lee Carter, who was elected to the equivalent to the Virginia state assembly. He is a classic liberal on issues such as health care and “protecting workers rights”, which he promises to do in the usual vague terms. He’s also an example of a 21st century Cold War liberal, meaning he’s a supporter of US imperialism, bragging about his service in the Marines, where he’s proud of his participation in the US invasion of Iraq and boasts about his family’s “service to our country” through its lifelong military involvement. The other DSA members who won are of a similar mold. 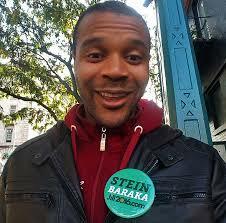 The only prominent DSA candidate in the recent elections who was not associated with the Democratic Party was Jabari Brisport, who ran for New York City Council from District 35. Brisport ran on the Green Party line, which means that at least he didn’t run from within the capitalist Democratic Party. In fact, he openly said that “the majority of Americans agree. We need more than 2 parties.” At least this wasn’t another move to further bind the working class to the Democratic Party. Unfortunately, Bridgeport pictured the Green Party as the alternative. Not only that but, typical of Greens, there was no link to the class issue as far as the Democrats. “The Green Party presents a strong alternative for progressives who don’t feel that the two major parties are a good fit for them,” he wrote. It is not a question of whether the Democrats are “a good fit”; it is a class question. 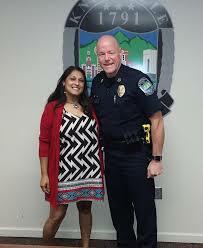 The potential for politics independent of the Democratic Party, however, were shown in the 8,600 people (29%) who voted for him in a heavily Democratic city. This was about eight times the number of votes that the Republican got! This shows the potential for a mass working class party to compete with the party of big business, the Democratic Party. There is a debate within the Democratic Party and among the mainstream political “pundits” over whether the Party should “triangulate”, meaning be just enough to the “left” of the Republicans to win over all those voters who are turned off by Trump and company, or whether they should represent a supposed difference by allowing the Bernie Sanders wing to rise. In fact, as Jesse Jackson pointed out in the 1980s, the Democrats need both wings. It’s in this light that the statement of the DSA leadership should be understood when they said “we’re showing the neoliberal Democrats how it’s done.” In other words, we’re showing the right wing of the Democratic Party that the Party can win more votes by feinting left. The problem is that this does absolutely nothing to build class consciousness among US workers; on the contrary, it helps confuse people on that score as the candidates’ comments quoted above show. The 2016 presidential election result was a mighty shock to the mainstream of the US capitalist class, which basically lost control of the presidency to a far right populist. Not only has Trump disrupted their “free” trade goals, he’s also tremendously destabilized US society with many of his comments (support for white supremacists, for example). His consistent support of slightly over 35% shows that there is a base for this. However, these election results also show that the majority of US citizens still oppose this open racism, chauvinism and general bigotry. That is welcome of course, but whenever a new crisis hits, the dangers are bound to increase if a working class alternative is not built. At this point, it seems it will take a real shock to jar things loose in the class struggle in the United States. However, shocks are in the very nature of capitalism itself, and doubly so for the present period. Tying ourselves to the Democratic Party makes it nearly impossible to respond adequately to such shocks whenever they arrive.